Reprinted here by permission is an article written by Mary Ann Goheen, based on an interview with Bob "Flash" Clayton, RRC. This article appeared in Fall 2004 Edition of The Reveille, a publication of District F ONTARIO COMMAND The Royal Canadian Legion. Thanks to Mary Ann for documenting Bob Clayton's memories, and to Bob for sharing the story of his life with us. This is a story of a frequently overlooked group of Canadians who were sent by our country to support the scant contingent of British and Hong Kong nationals to defend the British Colony of Hong Kong. Many would meet their fate in the battles that preceded the fall of Hong Kong or in the POW camps to follow. This article comes with a warning that what you read is graphic and disturbing. Bob Clayton, a Life member of #488 Brechin-Mara branch is the heart of this article. Comrade Bob agreed to talk to me about his experience as a serviceman and Hong Kong Prisoner of War. John & I met Bob and his wife Jesse at their cottage on the shores of Lake Simcoe just after Thanksgiving. Sitting around the kitchen table, Bob brought out several photos and some very important original documents from that period in his life. Bob liked the training and recalled going to summer camp in Niagara for two weeks. War preparations began in mid-August 1939. Told to report in uniform to the Armories , Bob and his fellow militiamen were transported to the Welland Canal and put on guard duty. 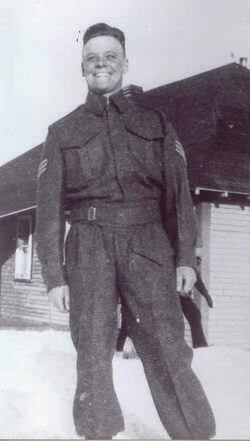 When they returned to Toronto Bob requested a transfer to the Royal Canadian Regiment. Bob volunteered to go to camp for overseas. “I looked older than I was...anyway my mother wrote and told them I was under age so they sent me back and I was transferred to the RCR depot in London”. Promoted to corporal, young Bob was training recruits. In the fall 1940 Clayton requested a transfer to the Royal Rifles and was sent to Quebec City to join the regiment and another promotion to Sgt. He was stationed at Val Cartier and did some duty in Newfoundland. Meanwhile overseas, Japan was looking to expand their Empire, had marched through China and were advancing toward Hong Kong—it was now 1941. Britain had a small contingent of soldiers guarding the colony. The British government under Churchill, knew that the likelihood of holding onto Hong Kong against the Japanese was a pipe dream. But in true British fashion, they wanted to maintain the ‘appearance of a force’ but were not prepared to commit any more of their own troops to the region. Britain’s main focus at the time was the German threat. Canada was called upon to send troops for support and our government quickly obliged. Approximately 2000 men from the Winnipeg Grenadiers and Royal Rifles found themselves on a train for a destination unknown to them. British intelligence had estimated the Japanese threat to be about 5000 soldiers when in fact it was more like 50,000. Bob and his chums were more interested in the sights of Hong Kong, the girls ...beer was cheap at 10 cents and rickshaw rides were a real novelty. Hong Kong also had a lot of tattoo parlours, and Bob christened his adventure with a permanent reminder on his arm—the Regimental Coat of Arms and the word “Mother”. It was not to be the only ‘souvenir’ he’d be bringing home when the fighting was over. Everyone knows that Dec. 7th 1941 at 7:50 am Japan bombed Pearl Harbour but what people don’t remember or realize that it was only hours later that Japan attacked the Philippines, Malaysia and Hong Kong. It was Dec. 8th… “I looked up and saw a V of airplanes...about that time I heard this British voice say “they must be up from Singapore”...I saw these black pieces falling from the planes….now I’d never been bombed before but I’m not stupid” Bob hit the first ditch he saw head first—the ditch was over six feet deep. Hong Kong is partly on the mainland and consists of an island as well. Initially the troops were defending mainland Hong Kong but with the advancement of the Japanese the Canadians were ordered to go back to the island of Hong Kong. After that the Hong Kong Chinese were at the mercy of the Japanese—–a quality that eluded many a Japanese soldier. “You could hear the screams coming from Kowloon...it was one massive scream all night long...made your hair stand on end” recalled Bob. The British were in charge of the Canadians and the expectation was that the island would be attacked by sea and in daylight. The attack came at night and the green recruits from Canada had only been in the Far East less than a month—now they were being bombed, fighting man-man and dying. The first Canadian casualty was Winnipeg Grenadier John Grey—he missed the ferry ride from the mainland to the island and was captured and killed. Lt. Scott would later be found tied together with four others and bayoneted. With shrapnel wounds to both legs, a bullet in one, a concussion and cut from flying glass when the ambulance was hit on route to the hospital at St. Stephens, Bob was quite a sight. It was Dec. 18th and Bob was not on the battlefield anymore. No one knew what was in store for them. Japan had not signed the Geneva Convention—their policy was not to keep prisoners of war or provide medical treatment let alone allow the Red Cross parcels or inspections of their POW camps. Rice was the main staple fed to the prisoners and not much of that—occasionally a vegetable of some description was dragged across it for minimal flavour. I asked Bob if he ate rice today and to my surprise he said he did in a variety of ways—fried, steamed etc. The only thing he couldn’t eat in the camp was “green horror”—the seaweed served on top of rice or made into a soup. In the camps of Hong Kong the main killer was ‘everything’ from dysentery, malaria, beriberi wet & dry, starvation. In the camps in Japan it was “pneumonia”. In the winter of ‘43, after about a year at Sham-Shui-Po, Comrade Bob and about 500 others were shipped to Japan in the hold of an old freighter…. “food was lowered to us in a bucket, ...it was a terrible trip...when we came out of the hold the Japs were holding their noses and my thought were ‘You bastards, we’ll have our day’.” Bob along with the others were sent to work in the shipyards of Yokohama. The Nippon Ko Kon is still in operation today, it is a multi national corporation but during the war the prisoners worked there building Japan’s war fleet. I examined the letter sent from Bob to his mother while in captivity.. “ It was 11 months before my mother learned I was alive—the mailman knocked on the door to personally give it to her.” I couldn’t help but wonder how many times Bob’s mother would have taken that letter out of her apron pocket or from the special place she kept it to read it over and over. Also in the mementos his mother had saved, was a letter of apology sent to Mrs. Clayton from the Red Cross. It stated in the letter “the Red Cross made every possible effort to assist our unfortunate prisoners in the Far East but the unco-operative attitude of the Japanese permitted only a minimum of Red Cross supplies to reach the prison camps.” “A lot more would have lived if we had received the parcels...sometimes they contained medicine, food, clothes. 4% of POW in German camps died compared to 27% POW in Japanese camps. The prisoners got little news and often any letters they received from home were almost a year old. The Japanese decided to move some of the POW’s to northern Japan to work in the coal mines—Bob was one of them. He was now relocated to Camp Sendai. Like the Germans, the Japanese had a final solution of their own for POW’s but the end of the war in the Far East came faster than Japan could ever predict. With the Atomic bomb hitting Hiroshima and Nagasaki ,came an abrupt end to the suffering of the POW’s . “The Americans dropped food into the camp….I weighed around 100 lbs when I came out of the camp...the Americans treated us great…” . Liberated by the Americans, 50 POW’s were taken to Tokyo and put aboard the USS Wisconsin. Appalled by the condition of the men, the Commander assigned a sailor to buddy-up with each POW with orders to get the POW “anything he wants...we could eat 24 hours a day….the Commander announced that they had some guys on board that hadn’t had much to eat for several years and that we would be going to the front of line at mealtime.” ‘Flash’ Clayton was paired with Bob Grillo and the men have kept in touch ever since. “They transported us to Guam where we were hospitalized and examined….we hadn’t heard much about Iwo Jima, the place of the famous photo of marines raising the US flag….over 6000 died in that battle, but I recall looking out from the ship and saying Thank You Very Much”. Hospital stays were mandatory for men who were barely alive, 3 weeks in Guam, 21 days on a Liberty ship from Guam to California and 3 days in Vancouver, before boarding a train for Toronto. More hospital time would follow but the the fighting was not over. 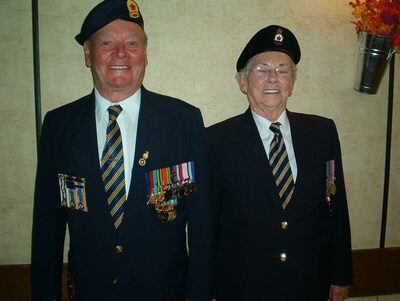 “The government didn’t want to recognize our conditions and give us any compensation….we organized the Hong Kong Veterans Association with members across Canada...Cliff Chadderton of War Amps has done a fantastic job on our behalf and I give credit to the Royal Canadian Legion for lobbying the government on our behalf. In typical bureaucratic fashion, the government finally acknowledged the HK vets a 50% POW pension in 1976 but only in the last 5 years have they granted the vets a 100% pension. The members have greatly reduced since 1945—200 died from the affects of their incarceration before the age of 50; 87 returned legally blind. Buried in Hong Kong from camp death are 264 Canadians, 137 died in camps in Japan and then there are the battle dead and those from the St. Stephen’s massacre to add to the count. “ What hurts the most is the number who died from conditions of our internment and even those who came home and died in spite of getting help here.” says Clayton. Bob celebrated his 20th birthday en route to Hong Kong and his 24th on the way home. He continues to suffer to this day from conditions acquired as a result of his internment—avitaminosis with residual effects and peripheral vascular damage and a slight limp from the bullet wounds he sustained. “We all suffer the after affects of starvation.” I asked Bob if there was ever a time when he felt he wasn’t going to get out alive… “NEVER—I never gave up that I would live through it.” Perhaps his ‘never give up’ motto held him in good stead all these years. Maybe it was something he inherited from his father—a WWI vet, Bob’s father served with the 20th Battalion at Vimy, Paschendale, Hill 70; his youngest brother joined the 6th Division and requested to serve in the Far East because his brother Bob was a POW. Canada pardoned the government of Japan for any wrongdoing, in effect kneecapping our Veterans claims for retribution. Returning to civilian life after the war, Bob worked for the City of Toronto worked his way up the ladder from labourer to superintendent in the public works department. He married another vet whom he had met in 1939. Jesse was a member of the CWAC Pipe Band, the only female military pipe band in history. Those girls marched and played the bagpipes through France, Belgium, Germany and Holland. And in 1946 Jesse piped her way to the Bob’s heart and they were married. They have 2 daughters, 3 grandchildren 7 great-grandchildren. Twenty-eight years ago, the Claytons moved to Brechin and became involved in Br. 488. Bob has served for many years as Sgt. At Arms for the branch and has been involved in that position at Zone level over the years as well. Bob speaks all over the province to schools and other groups about the Hong Kong conflict and subsequent treatment of POW’s and the importance of ’Remembrance’. In November he is speaking at a Whitby high school. “...participates in the Citizenship Reaffirmation Ceremony which began in our community several years ago...Bob spends many hours traveling to schools and class rooms in our surrounding community speaking to many students and educating them on the sacrifices of many fallen comrades in order for our Country to enjoy the freedom they fought for….We are truly proud of this man and love him dearly. I can’t think of anyone more deserving of the Queen’s Jubilee”. George MacDonell wrote the book “ One Soldier’s Story 1939-1945 From the Fall of Hong Kong to the Defeat of Japan” published by Dundurn Press 2002—Comrade Bob has sent me a copy of this book and I look forward to reading it. Next year will be the 64th anniversary of the fall of Hong Kong. “It will be our last hurrah!” says Clayton. This Nov. 11th, Bob will be in Ottawa laying the wreath on behalf of the Hong Kong Vets. Several speaking engagements have been organized for him over the 4 day trip along with newspaper interviews. The Toronto Star called him the other day for an interview. Repris ici, avec permission, est un article écrit par Mary Ann Goheen, selon une entrevue avec Bob « Flash » Clayton, des RRC. Cet article a paru à l’automne 2004 dans The Reveille, une revue du District F du commandement de l’Ontario de la Légion royale canadienne. Nos remerciements à Mary Ann pour avoir documenté les souvenirs de Bob Clayton, et à Bob pour nous avoir raconté sa vie. Voici l’histoire d’un groupe souvent négligé de Canadiens qui ont été envoyés par notre pays pour appuyer le maigre contingent de Britanniques et de citoyens de Hong Kong pour défendre la colonie britannique de Hong Kong. Plusieurs d’entre eux trouveraient la mort dans les batailles précédant la chute de Hong Kong ou dans les camps de prisonniers de guerre à suivre. Cet article est accompagné d’un avertissement que ce que vous y lirez est graphique et troublant. Bob Clayton, membre à vie du n° 488 du service Brechin-Mara, est au cœur de cet article. Le camarade Bob a accepté de me parler de son expérience en tant que militaire et prisonnier de guerre à Hong Kong. John et moi avons rencontré Bob et sa femme Jesse à leur chalet sur les rives du lac Simcoe, juste après l’Action de grâce. Assis autour de la table de la cuisine, Bob a fait sortir plusieurs photos et quelques documents originaux très importants de cette période de sa vie. Promu au grade de caporal, le jeune Bob s’occupait de la formation des recrues. À l’automne 1940, Clayton a demandé un transfert aux Royal Rifles et a été envoyé à Québec pour rejoindre le régiment, recevant une autre promotion, celle-là au rang de sergent. On le mit en poste à Val Cartier et il compléta une période de service à Terre-Neuve. Pendant ce temps, à l’étranger, le Japon cherchait à étendre son empire, avait traversé la Chine, et avançait vers Hong Kong. C’était l’année 1941. La Grande-Bretagne avait affecté un petit contingent de soldats à la garde de la colonie. Le gouvernement britannique, sous Churchill, savait que la probabilité de défendre Hong Kong contre les Japonais était un rêve illusoire. Mais de façon typiquement britannique, ils ont voulu maintenir « l’apparence d’une force », sans être prêts à affecter davantage de leurs propres troupes à la région. La Grande-Bretagne à l’époque se concentrait surtout sur la menace allemande. Le Canada a été appelé à envoyer des troupes d’appui et notre gouvernement a rapidement accepté. Environ 2 000 hommes de la Winnipeg Grenadiers et du Royal Rifles se sont retrouvés à bord d’un train pour une destination qui leur était inconnue. Les services de renseignements britanniques avaient jugé que la menace japonaise s’élevait à environ 5 000 soldats, alors qu’en fait le chiffre était plutôt environ 50 000. Bob et ses copains s’intéressaient davantage aux sites de Hong Kong : les filles... la bière n’était pas cher à 10 cents et les promenades de pousse-pousse représentaient une véritable nouveauté. Hong Kong avait également beaucoup de salons de tatouage, et Bob baptisa son aventure avec un rappel permanent sur le bras – les armoiries régimentaires et le mot « Mother » (mère). Ça ne serait pas le seul « souvenir » qu’il ramènerait à la maison à la fin des combats. Tout le monde sait que le 7 décembre 1941 à 7 h 50, le Japon a bombardé Pearl Harbour, mais ce dont les gens ne se souviennent pas ou ne se rendent pas compte est que quelques heures plus tard, le Japon a attaqué les Philippines, la Malaisie et Hong Kong. C’était le 8 décembre... « J’ai levé les yeux et j’ai vu un V d’avions... à ce moment, j’ai entendu une voix britannique dire « ils doivent venir de Singapour »... J’ai vu ces pièces noires qui tombaient des avions.... là, je n’avais jamais été bombardé, mais je ne suis pas stupide. » Bob a sauté dans le premier fossé qu’il a vu, la tête la première. Le fossé était d’une profondeur de plus de six pieds. Hong Kong est en partie sur le continent et comprend également une île. Au départ, les troupes défendaient la partie continentale de Hong Kong, mais avec l’avance japonaise, les Canadiens ont reçu l’ordre de retourner à l’île de Hong Kong. Après ça, les Chinois de Hong Kong se sont trouvés à la merci des Japonais – malgré que la miséricorde soit inconnue de plusieurs soldats japonais. « On pouvait entendre les cris venant de Kowloon... c’était un cri énorme continu toute la nuit... cela nous faisait dresser les cheveux sur la tête, » s’est rappelé Bob. Les Britanniques étaient responsables des Canadiens et on s’attendait à ce que l’île soit attaquée par la mer et en plein jour. L’attaque est survenue dans la nuit et les recrues vertes en provenance du Canada avait seulement été en Extrême-Orient moins d’un mois; ils se faisaient maintenant bombarder, luttant homme contre homme et mourant. La première victime canadienne a été le Winnipeg Grenadiers John Grey : il a raté le traversier du continent à l’île et a été capturé et tué. Le lieutenant Scott allait plus tard être trouvé lié avec quatre autres et ayant été passé à la baïonnette. Avec des éclats d’obus aux deux jambes, une balle dans une de celles-ci, une commotion cérébrale et des éclats de verre l’ayant coupé lorsque l’ambulance avait été frappée sur la route vers l’hôpital à St. Stephens, Bob présentait tout un tableau. C’était le 18 décembre et Bob n’était plus sur le champ de bataille. Personne ne savait ce qui était en réserve pour eux. Le Japon n’avait pas signé la Convention de Genève— leur politique était de ne pas garder des prisonniers de guerre ou de fournir de traitement médical et encore moins permettre l’entrée des colis de la Croix-Rouge ou des inspections de leurs camps de prisonniers de guerre. La seule chose qu’il ne pouvait pas manger dans le camp était « l’horreur verte » — les algues servies sur du riz ou cuites en soupe. Dans les camps de Hong Kong, la principale cause de décès était « tout », soit la dysenterie, le paludisme, le béribéri œdémateux et béribéri sec, et la famine. Dans les camps au Japon, c’était « la pneumonie ». L’hiver de 1943, après environ un an à Sham Shui Po, le camarade Bob et environ 500 autres ont été expédiés au Japon dans la cale d’un vieux cargo... « La nourriture nous était descendue dans un seau... ce fut un voyage terrible... quand nous sommes sortis de la cale, les Japonais se tenaient le nez et j’ai pensé « salauds, nous aurons notre heure de gloire. » Bob et les autres ont été envoyés travailler dans les chantiers navals de Yokohama. Le Nippon Ko Kon est toujours en opération aujourd’hui; c’est une société multinationale, mais au cours de la guerre, les prisonniers y travaillaient à la construction de la flotte de guerre du Japon. J’ai examiné la lettre envoyée par Bob à sa mère alors qu’il était en captivité. « Onze mois se sont écoulés avant que ma mère n’apprenne que j’étais en vie. Le facteur est venu frapper à la porte personnellement pour lui donner la lettre. » Je ne pouvais pas m’empêcher de me demander combien de fois la mère de Bob aurait pris cette lettre de sa poche de tablier ou de la place spéciale où elle la gardait pour la lire encore et encore. Quatre pour cent des prisonniers de guerre dans les camps allemands sont morts, par rapport à 27 % dans les camps japonais de prisonniers de guerre. Les prisonniers recevaient peu de nouvelles et souvent les lettres reçues de la maison dataient de presque un an. Les Japonais ont décidé de transférer une partie des prisonniers de guerre au Nord du Japon pour travailler dans les mines de charbon. Bob était l’un d’eux. Il avait été envoyé au camp de Sendai. Comme les Allemands, les Japonais avaient leur propre solution finale pour leurs prisonniers de guerre, mais la fin de la guerre en Extrême-Orient est arrivée plus vite que le Japon ne pourrait jamais l’avoir prévu. Lorsque la bombe atomique d’Hiroshima et de Nagasaki est atterrie, ce fut la fin abrupte de la souffrance des PG. « Les Américains ont largué de la nourriture dans le camp... je pesais environ 100 livres quand je suis sorti du camp... les Américains nous ont vraiment bien traités... » Libérés par les Américains, 50 prisonniers de guerre ont été emmenés à Tokyo et embarqués à bord du USS Wisconsin. Consterné par la condition des hommes, le commandant a affecté un marin à titre de copain pour chaque prisonnier de guerre, avec ordre de donner au prisonnier de guerre « tout ce qu’il veut... on pouvait manger 24 heures par jour... le commandant a annoncé qu’ils avaient des gars à bord qui n’avaient pas eu beaucoup à manger pendant plusieurs années et que nous allions en tête de la file d’attente au moment des repas. » « Flash » Clayton a été jumelé avec Bob Grillo et les hommes sont restés en contact depuis. Les séjours à l’hôpital étaient obligatoires pour les hommes qui étaient à peine vivants : trois semaines à Guam, 21 jours sur un navire Liberty de Guam à la Californie et trois jours à Vancouver, avant de monter à bord d’un train pour Toronto. Plus de temps à l’hôpital suivrait mais les combats n’étaient pas terminés. « Le gouvernement ne voulait pas reconnaître nos problèmes de santé et nous donner une quelconque indemnisation... nous avons organisé l’association des anciens combattants de Hong Kong avec des membres de partout au Canada... Cliff Chadderton des Amputés de guerre a fait un travail extraordinaire pour nous et je dois reconnaître la Légion royale canadienne pour avoir fait pression sur le gouvernement en notre nom. En mode bureaucratique typique, le gouvernement a finalement accordé aux anciens combattants de la bataille de Hong Kong une pension de PG de 50 % en 1976, mais seulement au cours des cinq dernières années a-t-il accordé aux anciens combattants une pension de 100 %. Le nombre de membres a considérablement diminué depuis 1945 : 200 sont morts avant l’âge de 50 ans des effets de leur incarcération; 87 sont revenus aveugles au sens de la loi. Enterrés à Hong Kong après la mort dans les camps sont 264 Canadiens; 137 sont morts dans les camps au Japon et il y a aussi les morts au combat et ceux du massacre de St. Stephen’s qu’il faut ajouter au total. « Le plus douloureux, c’est le nombre qui a succombé des conditions de notre internement et même ceux qui sont revenus au pays et sont morts en dépit de l’obtention d’aide ici, » explique Clayton. Bob a célébré son 20e anniversaire en route vers Hong Kong et son 24e sur le chemin du retour. Il continue de souffrir à ce jour de problèmes de santé acquis à la suite de son internement : l’avitaminose avec effets résiduels, et les dommages vasculaires périphériques avec une légère claudication due aux blessures par balles qu’il a subies. « Nous souffrons tous des séquelles de la famine. » J’ai demandé à Bob s’il y avait eu un moment où il sentait qu’il n’allait pas en sortir vivant... « JAMAIS, je n’ai jamais abandonné l’espoir que je survivrais. » Peut-être sa devise de « ne jamais abandonner » lui a bien servi toutes ces années. Peut-être que c’est quelque chose qu’il a hérité de son père : ancien combattant de la Première Guerre mondiale, le père de Bob a servi auprès du 20e bataillon à Vimy, Passchendaele, côte 70; son plus jeune frère a rejoint la 6e division et a demandé de servir en Extrême-Orient parce que son frère Bob était un PG. Le Japon refuse de reconnaître les PG de quelque manière que ce soit. Il n’y a eu aucunes excuses officielles, et aucune compensation ni du gouvernement japonais, ni des sociétés qui ont utilisé ces hommes à titre de main-d’œuvre esclave. En 1952, sans la permission de l’Association des anciens combattants de la bataille de Hong Kong, le Canada a pardonné le gouvernement du Japon pour tout acte répréhensible, ce qui a effectivement détruit les réclamations de compensation de nos anciens combattants. De retour à la vie civile après la guerre, Bob a travaillé pour la Ville de Toronto, grimpant l’échelle du poste de travailleur à celui de surintendant au sein du département des travaux publics. Il a épousé une autre ancienne combattante qu’il avait rencontrée en 1939. Jesse était membre du corps de cornemuses du Service féminin de l'Armée canadienne (CWAC), le seul corps de cornemuses militaire féminin de toute l’histoire. Ces filles ont défilé et joué de la cornemuse à travers la France, la Belgique, l’Allemagne et la Hollande. Et en 1946, Jesse a soufflé ses mélodies jusqu’au cœur de Bob et ils se sont mariés. Ils ont deux filles, trois petits-enfants et sept arrière-petits-enfants. Il y a 28 ans, les Clayton sont déménagés à Brechin et se sont engagés au sein de la branche 488. Bob a servi pendant de nombreuses années en tant que sergent d'armes pour la branche et a comblé cette position au niveau de la zone au fil des années également. Bob parle partout dans la province aux enfants dans les écoles et à d’autres groupes au sujet du conflit à Hong Kong, du traitement subséquent des prisonniers de guerre et de l’importance du Souvenir. En novembre, il parlera dans une école secondaire de Whitby. George MacDonell a écrit le livre One Soldier’s Story 1939-1945 – From the Fall of Hong Kong to the Defeat of Japan (Histoire d’un soldat 1939-1945 – De la chute de Hong Kong à la défaite du Japon), publié par Dundurn Press en 2002. Le camarade Bob m’a envoyé une copie de ce livre et je suis impatient de le lire. L’année prochaine sera le 64e anniversaire de la chute de Hong Kong. « Ce sera notre dernier tour de piste! » dit Clayton. 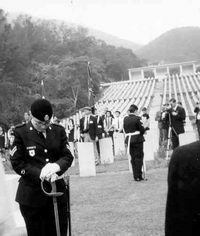 Ce 11 novembre, Bob sera à Ottawa pour déposer la couronne au nom des anciens combattants de la bataille de Hong Kong. Plusieurs allocutions ont été organisées pour lui au cours du voyage de quatre jours, avec des entrevues dans les journaux. Le Toronto Star a appelé l’autre jour pour une entrevue.